BlackBerry Storm page live on Verizon? | BlackBerry Blast! BlackBerry Blast! > News > BlackBerry Storm page live on Verizon? BlackBerry Storm page live on Verizon? 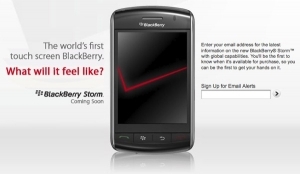 According to engadget, Verizon's BlackBerry Storm page went live today. Currently the page seems to be redirected so perhaps they've taken it down. This is just further evidence (like we needed anymore evidence) that the BlackBerry Storm is going to be released on Verizon very soon.